“Ok then, let’s do it!” he replied. Dressed head to foot for desert hiking, our multi-layered long sleeved shirts, leather gloves and long pants would be a good defense against a brushy corridor should we encounter one. I wanted to hike down into a long skinny gorge we had spotted some years ago. 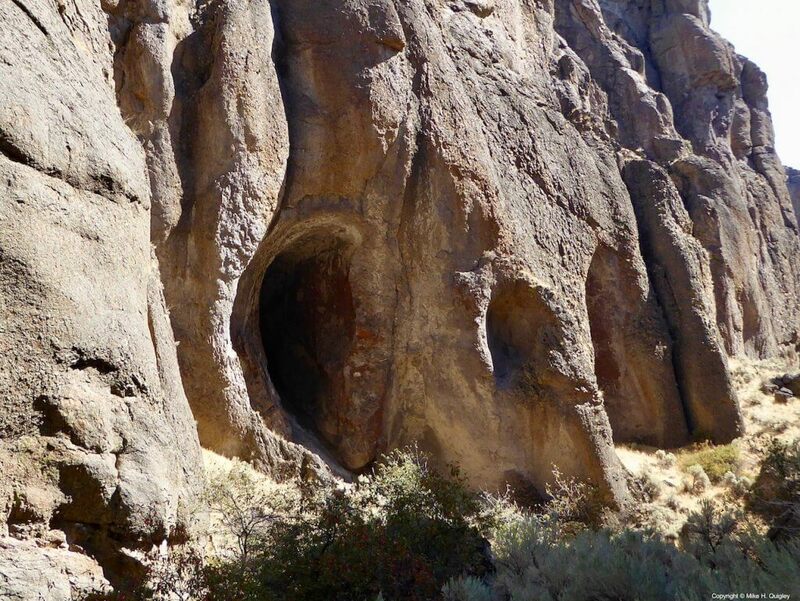 It formed a deep ragged finger, a gash in the earth’s crust that branched off from a tributary of the Owyhee. From camp we dropped down about 160 feet into a dry wash. Looking upstream the drainage remained fairly open. Only a few exposed rocky outcroppings poked out from the grassy edges of the swell. Facing downstream, the ancient draw had worn its way down to bedrock, finding the soft spots, washing them out, chiseling a jagged, narrow path through a deep layer of rhyolite. It was slow work, this erosion, about a million years worth so far: a tenacious and continuing effort. Within a hundred yards of hiking we found ourselves bound in by vertical stone walls on both sides. As we followed the meanders of the wash the first 3/4 mile was easy going, a gradual descending gradient with few obstructions and a sandy bottom. Shaded by ever-rising cliff walls, now over 100 feet high, it was chilly. The little gorge ran in a north south direction. A low hanging morning sun would not illuminate nor warm this narrow chasm for several more hours, but our layered clothing kept us warm and comfortable. Stepping around a sagebrush patch, we came upon the mornings first treasure: a fully intact skull with antlers of a four point buck, counting the eye horns. The antler’s inside spread was about two feet across. It was a big deer. A couple small patches of hair remained in hard to reach areas where antlers and skull came together. No blood stained the skull and no other bones were found in the immediate area. Whatever the story of this buck’s demise, we were left to speculate. A short distance beyond the skull the canyon began to fill with brush and narrowed to a width of 20 feet, in a few areas. On this point, Mike and I do not agree. He thinks it was much wider. But as a sometimes compass-man for my father on a timber cruise, and from countless wagers with my dad about distances when computing the required cut into a slope during a road survey, I’ll stick to my estimate as the better assessment. We began a bush whack through brush and small trees so dense that every foot was a battle won. Everything grabbed at us, pulled us back, snapped in our faces, tripped us up, poked through our clothing. Little pockets of water began to appear and along with them, thickets of wild roses, stinging nettles and long canes with prickles that resembled devils club. You couldn’t always determine or even see what-was-what until you latched onto it. The dense vegetation continued for over a mile, clearing slightly whenever we came upon a rockfall or dry waterfall. There were three of them; two with impassable drops we were able to find a work-around and one long rock fall, a steep boulder garden, we scrambled down. Somewhere along the way I remember asking Mike if we were having fun yet. But I knew the answer. We were in our element: comfortable to the bone. The anticipation of what we might see around the next gnarled bend pulled us along. Water bubbled up from the wash bottom forming deep pools along the edges of the cliff, feeding the dense vegetation into a green blockade. The water’s surface vibrated with the life of hundreds of water skippers striding across the little pool. Tiny frogs jumped up in all directions with every cautious footstep. “Are they baby spotted frogs?” I wondered to myself. After a few yards, the water disappeared beneath the wash only to resurface again a little farther downstream. We spotted a clearing ahead, but before breaking through to it, I just happened to glance to my right. “Mike, look!” I said, amazed at what we had nearly missed: a cavern in the shape of an enormous cathedral window, its narrow arch rising nearly 40 feet above us. “Wow, that’s pretty big! Go stand by the entrance so we can see the scale of it,” he instructed, while unzipping the camera bag to take a picture. I stood a couple yards ahead of Mike upon a deposit of sand and rock in the middle of the gorge bottom. 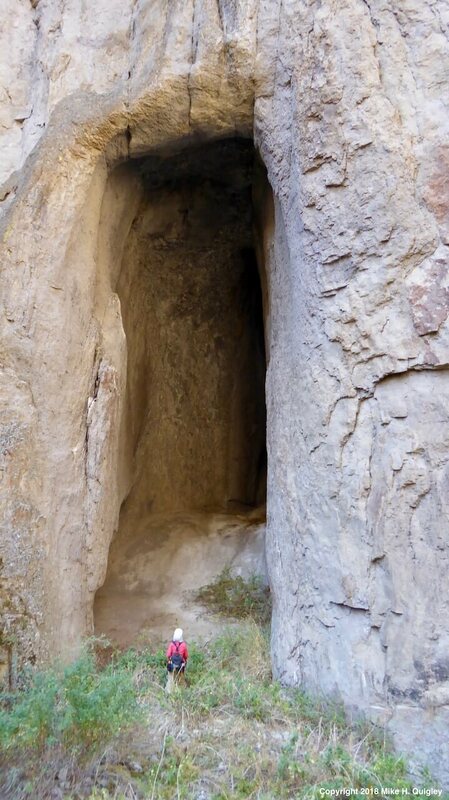 I dropped down several feet into a trough that ran in front of the cavern and into a thicket of wild roses and nettles that guarded the cave entrance. Once through the thicket, the cave floor sloped upward for about ten feet in distance and then leveled off. We moved on into the brushless open space downstream and found a series of eroded alcoves with cathedral window shapes, too small to occupy, on the opposite cliff wall. Sunlight partially illuminated sections of the small caves, created interesting shadow formations: one in the form of a human skull. The southern light streamed into our slim rift in the earth from the confluence with a larger tributary just 100 feet downstream. I glanced at my watch; it was 11:30 a.m. It had taken us four hours to navigate the short 2.2 miles to the intersecting canyon. At this point, the walls of the narrow little gorge now rose 800 feet above us. We were ready for some rest and glad to be free of the dense brush. After a short break we zig zagged our way downstream along the edges of the larger side canyon, crossing the stream that ran through it several times, keeping watch for a route back up and out to the scrublands above. The sun, reflecting off the vertical walls of the canyon, intensified the heat in the drainage. We had stripped down to one light shirt layer yet still we were hot. After a mile of hiking in the heat, we found our slot out to the upper reaches. But first, we rested, spreading out on a patio of flattened boulders, we ate our lunch along the creek in the shade of a large over-hanging shrub. Refreshed, we began the return trek. one-third of the ascent. Once above the scree field we could hug the cliff wall, which would offer shade. On a steep incline, we looked for the uphill side of bunchgrass or sagebrush, a nubbin of rock embedded deep within the ground, or a solid outcropping of stone pockmarked with little ledges and indentations, anything that insured a solid footing or handhold and kept us from a sliding fall. It’s hard work and we rested often so that we might enjoy the climb, frequently pausing as briefly as 30 seconds to steady the breathing, occasionally longer to break for water and sit upon a boulder to survey our progress and savor the view. We summited tired, yet not fully spent, to begin a two mile hike across a gently undulating grassland, using the narrow gorge breaks as our handle to guide us back to camp. We had covered about 5.3 miles on our eight hour loop hike. Fully content and ready for a good long sit, we poured ourselves a glass of wine, reflected upon the day’s events, feeling richly rewarded from the experience of discovering a truly native landscape in the Owyhee, the first in a very long time. Did you know that water skippers can walk on water because they have many tiny grooved hairs on their legs that trap air? That’s right; they have their very own flotation device! These hair-trapping legs make them so buoyant they can support fifteen times their weight. They have six legs, like all insects, but the front pair are short, which enables them to quickly grab prey. We can thank a water skipper for eating mosquito larvae, which means fewer mosquitos! The larvae remain under water, and out of reach, but they breathe through a snorkel. The water skipper grabs the snorkel and eats the larvae! To learn many more fun facts about the water skipper, check out Cool Green Science – 7 Cool Facts About Water Striders by Matthew L. Miller. Did you know that there are 15 species of bats in Oregon? Our native bats eat only insects and can eat about 1,000 insects per hour! So if the water skipper misses a few mosquito larvae, thank a bat! The bats on this hike could have been Canyon Bats, but there are several other species that also inhabit the Northern Basin & Range region.